In 1807, (after the founding of Canton), John Shorb and his family settled in Canton and were the first representatives of the Catholic Church. By 1812, there were 15 Catholic families. Father Edward Fenwick came to offer the first Mass in the area. Because of the crowd drawn from outlying areas, it was held outdoors, under an oak tree at the Shorb farm. Father Fenwick became the first bishop of Cincinnati and all of Ohio in 1822. In 1823 he gave permission to build a church on 5 acres of land donated by John Shorb, the present site of the church. The first church was a brick structure 40 feet by 90 feet. Bishop Fenwick dedicated it in 1824. St. John’s became a center of missionary activity. Its pastors ministered to Catholics in more than 20 counties, and 15 parishes were founded as missions of St. John’s . The first church was enlarged twice, and by 1867, was no longer adequate. Under the new pastor, Father Berthelet, the present church was built 1870-1871. The original church was demolished. The present St. John the Baptist Catholic Church was built of pure Gothic design with a clerestory. The church without tower and sacristies is 144 feet long and 60 feet wide. The cornerstone was laid Sunday, July 10, 1870, with a crowd of 5,000 people present. The church was dedicated by Bishop Gilmour on December 29, 1872 . The architects were Renwick and Kiely of Brooklyn, New York, who also designed St. Patrick’s Cathedral in New York City. The cost, without interior decorations was $80,000. It was listed in the National Register of Historic Places in 1974, the 150th anniversary of the parish. The marble altar was consecrated by Bishop Hortmann on February 10, 1897 . The Bavarian terra cotta Stations of the Cross were erected in 1896. The stained glass windows depicting the 15 mysteries of the Rosary were erected in 1909. 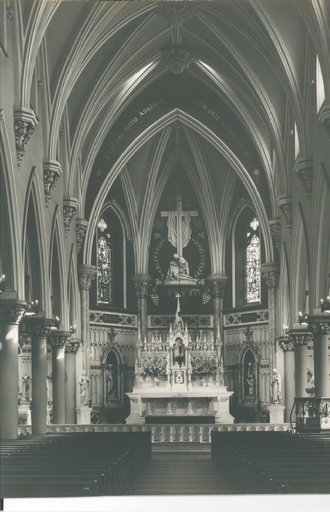 In 1924, the church was refurbished for the occasion of its centennial celebration. The Repository described the ceremonies, with three bishops, over a hundred clergy, and thousands of people, as significant and impressive. In 1925, Monsignor Graham established radio station WHBC at the church in order to broadcast his sermons. WHBC, long since sold to secular interests, remains as the preeminent radio station in the city of Canton. The original pipe organ was built by the A.B. Felgemaker Company (Opus 253) in 1883. The Felgemaker organ was replaced by a Tellers Organ (Opus 302) around 1923/1924, a 3 manual, 25 stop instrument. It fell into disrepair around 1964 and was removed in the mid 1970’s. In 1978, 2 historic E.M. Skinner pipe organs were purchased (from First Methodist – Akron and Carnegie Hall – Pittsburgh , PA) and combined to make the magnificent organ that lead our worship until May of 2003. It contained 78 ranks (sets of pipes). Combined with the wonderful acoustic of St. John’s, it was an impressive organ. Portions of this organ were reused in our Kegg Organ (2004). Read about our organ. In 1980, the interior of the church was renovated. It included broadening the main floor of the sanctuary and removal of the old marble rails. Marble from these rails was incorporated into the base of the pillars at the edge of the sanctuary. The white marble Baptismal font was moved into the congregation seating area during this renovation. In 1997, the Gallery (organ and choir loft) was expanded. In 2000, the whole interior was cleaned and repainted. Other features of the church include the spire atop the bell tower. It soars 180 feet into the air. The tower contains a great clock with four faces, and four bells (for the Westminster strike) and the original 1,000 pound church bell named in honor of St. John the Baptist. In 2008, the Tower Clock faces were replaced, and a new bell controller system was installed. 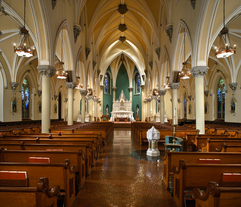 On June 19, 2012, our parish was elevated to a minor basilica by the Holy See (Vatican). Our application was encouraged (and approved at the Diocesan level) by our Bishop, the Most Reverend George V. Murry, S.J., Ph.D. (Youngstown Diocese), the United States Council of Catholic Bishops and the Holy See. Our Ombrellino was constructed in Atlanta Georgia under the watchful eye of Deacon Michael Balfour (Pastoral Administrator of the Basilica of the Sacred Heart of Jesus, Atlanta Georgia). Deacon Balfour also worked with our committee in designing our Coat of Arms. The Ombrellino is an elaborate umbrella which was used to protect the Holy Father from inclement weather. The panels of the Ombrellino are made of alternating red and yellow silk fabric (Papal colors). It is always displayed half-way open to signify that this church is ready to welcome the Holy Father. Our Tintinnabulum was constructed by Mr. Charles Kegg (Kegg Pipe Organ Builders) using symbols from within the basilica. Mr. Kegg also built the organ used in the basilica. The Tintinnabulum is a bell which had the practical function of alerting the people to the approach of the Holy Father during papal processions through the streets of Rome. Both the Tintinnabulum and the Ombrellino are permanently displayed in the sanctuary of the Basilica. The Basilica Committee: Mr. George Mangus (Parish Council President), Mr. David Kaminski (Parishioner), Mrs. Lurene Reed Gasser (Parishioner), Mrs. Kimberly Musille (Director of Religious Education), Mr. Robert Sullivan (Organist and Director of Music/Liturgy and Basilica Administrative Assistant) and the Very Reverend Ronald M. Klingler (Rector).